Funders / Commissioners: High Line Art is funded by Donald R. Mullen, Jr.; The Rockefeller Foundation's New York City Cultural Innovation Fund; The Greenwall Foundation; Vital Projects Fund, Inc.; and public funds from the New York City Department of Cultural Affairs in partnership with the New York City Council and the New York State Council on the Arts. Cost Details: First two sections of High Line cost USD152,000,000. Ongoing maintenance costs between USD3,500,000 and USD4,500,000 per annum. Friends of the High Line funds over 90 per cent of the High Line’s annual operating budget. Friends of the High Line is a non-profit, private partner to the New York City Department of Parks & Recreation. Location Details: Old railway line on lower West Side, running from Gansevoort Street to 30th Street, Manhattan. Date of Delivery: The first and second sections of the High Line park were completed in 2009 and 2011 respectively. The third section has been commenced and is due to be completed in 2014. Dimensions / Technical Specs: 2.3 km-long elevated rail structure. Variable dimensions for each installation. Project Delivery Team: James Corner Field Operations (Landscape Architects), Diller Scofidio + Renfro (Architects), and Piet Oudolf (Planting Designer). Elevated above the urban streets of New York City, the High Line is a public park built on an abandoned freight railway line on Manhattan’s West Side. The High Line comprises a 2.3 km strip of parkland that runs across 19 blocks in the middle of the City. The park was designed by a team of architects, landscape architects and a planting designer to create a sustainable urban refuge providing green space to city dwellers. The organisation Friends of the High Line has developed extensive public programs including public art, cultural events, cafes and food outlets to ensure that the High Line is an asset to the community. The High Line has a high profile public art program, High Line Art, which commissions prominent international contemporary artists to produce installations, performances, video works and billboard interventions. 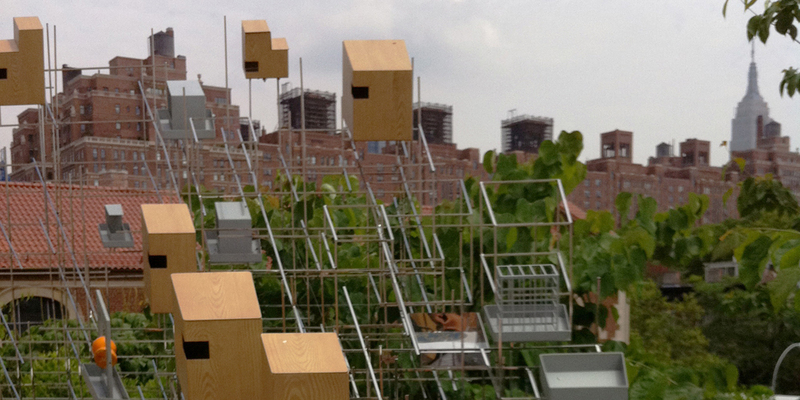 Although the majority of the artworks do not exactly maintain an ‘eco-art’ or sustainable focus, they are created to be site-specific and directly engage with the High Line and surrounding city environment. High Line Art has an appointed curator and is independently funded. Several notable works are described below. Still Life with Landscape (Model for a Habitat) by Sarah Sze (2011—12): Still Life with Landscape (Model for a Habitat) was an architectural installation that dually interacted with the New York skyline and provided a habitat for birds and insects. Layers of stainless steel rods were criss-crossed to form a three-dimensional geometric structure that resonated with different types of urban environment. Sitting amongst the structure were wooden boxes and platforms providing food, water and shelter to wildlife. 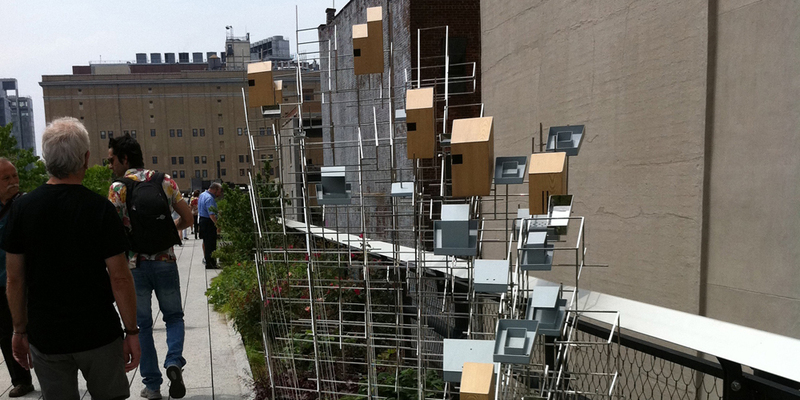 From June 2011 to June 2012, the installation sat within the High Line gardens creating a frame for the surrounding flora, whilst connecting it with the urban landscape. This work poetically drew attention to the natural habitats that exist within the City. Make a Salad by Alison Knowles (2012): Alison Knowles’ 1962 Fluxus performance, Make a Salad, was re-staged as part of the High Line Art Performances program. The performance involved Knowles creating a giant salad—large enough to feed 1000 people—whilst a musician performed Mozart. The salad included locally sourced lettuce, carrots, cucumbers, onions, celery and mushrooms. Once the salad was mixed and dressed, it was served to the audience. The River That Flows Both Ways by Spencer Finch (2009–2012): Another of the City’s historical transportation routes—the Hudson River, inspired The River That Flows Both Ways. The installation features coloured glass windowpanes set in the existing window frames of the Chelsea Market Passage. Finch documented the river’s surface, taking a photograph every minute, then selected one pixel of colour to create each windowpane. The result is a collection of muted hues of blue, green and brown, resembling the organic tones of water and land. Aesthetic/Visual: The aesthetic aim of the High Line was to transform an abandoned railway line to a green space whilst maintaining the history and cultural heritage of the area. The public park was designed to be a vibrant forum for public artworks. Innovation/Risk (Conceptual): To align all governing bodies in agreement for redeveloping High Line site and apply a multidisciplinary approach to creating public space. Audience Engagement: To build local support for project and find new and diverse means of attracting visitors. Social Activation and Community Development: To build community ownership of public space by creating a shared space for local residents. Another aim was to activate widespread regeneration of West Side area of Manhattan. Health and Well-Being: To provide more green public spaces for a city that has dense housing, and to provide access to public art. Waste Reduction and Management: To minimise green waste by composting garden refuse. Energy Efficiency/Generation: To install LEDs throughout the High Line to maximise energy efficiency. Water Quality and Management: To create a ‘green roof’ system that allows plants to retain large amounts of water, and to support this by installing rainwater tanks to collect water for watering gardens and drip irrigation, thus minimising water usage. Attracting Investment and Improving Output: To create a sustainable business model to enable the High Line to exist over the long term. Innovation/Risk (Conceptual): Regeneration of the High Line has formed a model for change that can be applied to other industrial sites. Audience Engagement: The High Line has introduced site-specific public art commissions, events, and public programs to attract visitors. The park is frequented by local residents, and interstate and international visitors. Social Activation/Community Development: The High Line has acted as triggering point for regeneration of unused public spaces in the city, in New York City and elsewhere. It has given residents ownership of their local area and created community pride. Water Quality and Management/Air Quality: The green roof technology has reduced stormwater run-off by up to 80 per cent. The trees and plants have improved air quality by releasing oxygen. Habitat Provision and Restoration: The trees and plants provide shade and a cooler environment for visitors, and a habitat for insects and birds. Regeneration and Tourism: The High Line is one part of the greater regeneration of the West Side area, which until recently was largely industrialised wasteland. Old factory warehouses in the Meatpacking District (at the south end of High Line) have been transformed into art galleries, restaurants, cafes, hotels and high-end retail outlets. The park has increased activity in this area by attracting local residents and tourists alike. Attracting Investment: The regeneration of the High Line has substantially contributed to broader redevelopment of the area, which includes the Whitney Museum’s plans to build a new museum in 2015 and internationally renowned architects, including Frank Gehry, Jean Nouvel and Neil Denari, designing new buildings in surrounding streets. Jobs: Employment has been created for workers in various industries, including artists, gardeners, educators and food-related businesses. After its decommission from commercial use in 1980, there were plans to demolish the High Line. Two local residents, Joshua David and Robert Hammond, formed Friends of the High Line in 1999 to advocate for the railway line to be regenerated and preserved for public use. After ten years of campaigning, negotiating, developing and building, the first section of the High Line was opened in June 2009. The second section opened in 2011 and the third section is due for completion in 2014. After an extensive public commissioning program, Friends of the High Line and the City of New York selected urban design firm James Corner Field Operations, architects Diller Scofidio + Renfro and planting designer Piet Oudolf to develop and build the High Line. The major challenge facing the project was that of gaining and securing appropriate approval to develop the site. This was an arduous task which involved initially gaining support of local government—the City of New York, then acquiring approval from the Federal Surface Transportation Board to authorise the High Line to be used as a recreational trail, and then finally the consent of the owners of the High Line, CSX Transportation, Inc. to allow the High Line park to be built. In 2005, CSX Transportation, Inc. donated the structure to the City, to be redeveloped into the High Line. Although government bodies funded the initial design and development, the High Line relies heavily on philanthropy and fund-raising for ongoing maintenance and growth. Friends of the High Line has managed to continually raise funds, however it will be an ongoing strain to safe-guard the park long-term. The High Line eventuated from years of community advocacy, consultation and development. What began as a grass-roots project has grown into a large, multi-faceted public organisation encompassing managing and funding the park’s growth and maintenance, in addition to a notable public art program. 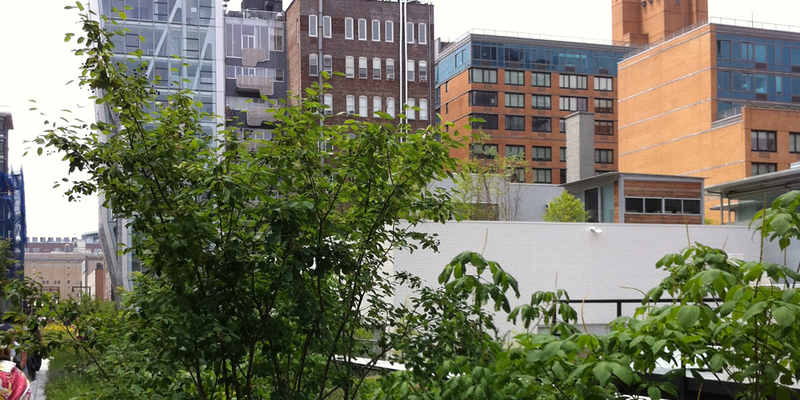 Sustainable and regenerative practices were crucial to the design and development of the High Line. Essentially the High Line was built similarly to a green roof system that reduces water wastage and functions as a cooling agent to the hard surfaces of surrounding buildings. 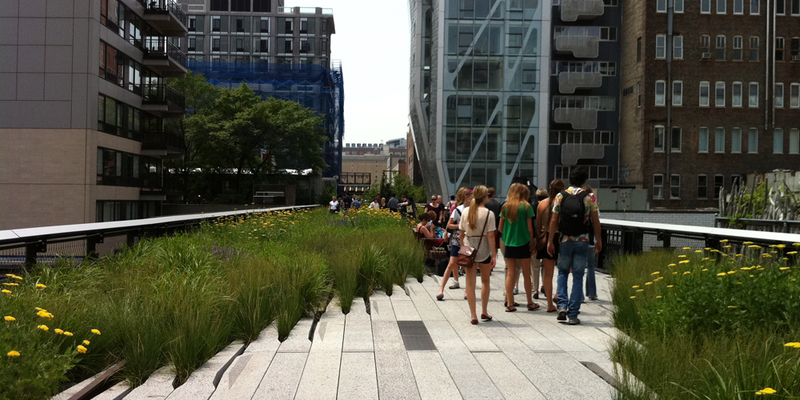 Sustainable infrastructure was incorporated into the design of the High Line, including perforated plastic drainage panels to assist in water retention, drainage and stormwater run-off. The gardens were also specifically designed to contain rivets and channels to control the amount of water directed to the plants, whilst reducing excessive water run-off. The majority of plants selected for High Line are native to New York and were sourced from local nurseries and suppliers within a 160 km radius of the city. The construction materials for the garden, including concrete, steel and timber were also sourced locally and chosen on the basis of their “life-cycle costs to reduce the need to replace and dispose of materials after a short time.” All timber used was sustainably harvested from ethically managed forests. The lighting is energy efficient LEDs. The High Line staff upholds sustainable methods for maintaining the park, including drip irrigation to conserve water, composting facilities, environmentally friendly cleaners and solvents, and gardening without pesticides. Friends of the High Line. 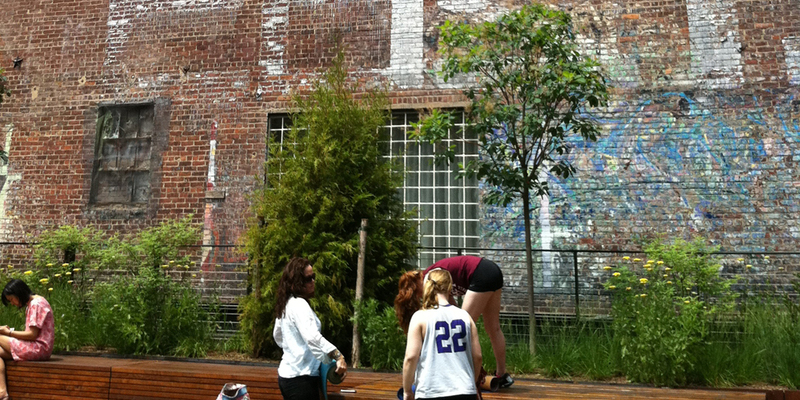 “High Line Art.” High Line. http://www.thehighline.org/about/public-art (accessed May 16, 2012). Friends of the High Line. “Sustainability.” High Line. http://www.thehighline.org/sustainability (accessed May 16, 2012). Pilkington, Ed. “High Line Park on Disused Railway in New York Opens Second Section.” The Guardian, June 9, 2011. http://www.guardian.co.uk/world/2011/jun/08/high-line-park-new-york (accessed May 16, 2012). Pogrebin, Robin. “Renovated High Line Now Open for Strolling.” The New York Times, June 8, 2009. http://www.nytimes.com/2009/06/09/arts/design/09highline-RO.html (accessed May 16, 2012).